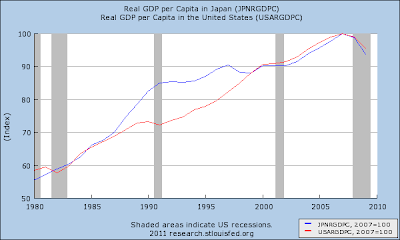 While addressing some myths about Japan, Bill Mitchell posted some graphs of contributions to real GDP. His graphs cover the same data I graphed last August -- the contributions of Consumption, Investment, Government Spending, and Net Exports toward inflation-adjusted economic growth. (A minor difference is I separated Inventories and other Investment in my graphs). Bill also usefully added in Ireland while emphasizing the negative effects of austerity on growth. Visuals such as these make it obvious that investment falls under austerity -- it doesn't rise on a supposed swell of increased business confidence that austerity proponents often claim will be triggered! 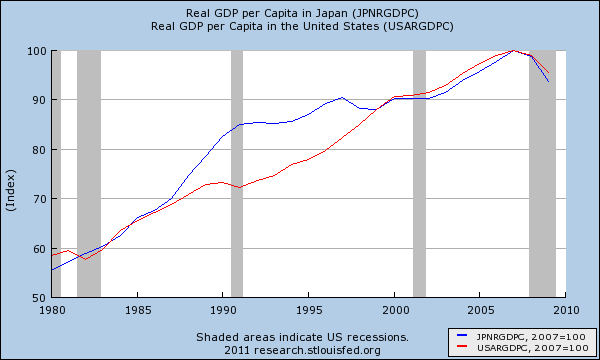 The blue line is for Japan, the red line for the US. It is quite astonishing how close in both magnitude and direction US and Japanese growth have been, when adjusted for population changes! The main divergences are Japan's burst of higher growth in the late 1980s, and its austerity-driven recession in the late 1990s. Once you adjust real GDP growth for changes in population, what you are left with is largely productivity growth. There are other factors that affect the level of GDP (and important things like employment!) but they have less effect on year-on-year growth rates once the adjustment has occurred. Japan's famous deleveraging primarily meant a higher savings rate than before the deleveraging (corporate rather than household, in Japan's case), with the main effect being a one time shift downward in GDP level (but not growth). After the GDP shift caused by a savings rate shift, future and ongoing GDP growth is impacted by other factors such as whether aggregate demand is sufficient to bring growth back near potential growth, but Japan may have been a success story in this area! However, its success in achieving this real per-capita GDP growth may have been more a result of the falling household savings rate over the last couple decades than of government fiscal (or monetary!) policy. Japan's stagnation myths (some people blame too much government spending, others too little!) derive in part from two sources of confusion -- real growth versus nominal growth (Japan has a low and sometimes negative rate of inflation) and GDP growth versus per capita GDP growth (Japan has a low-to-negative population growth trend). 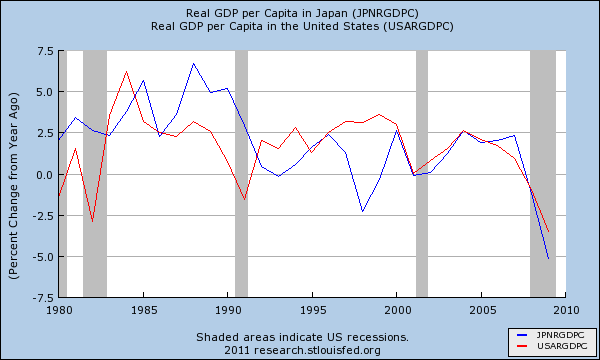 To supplement the year-on-year growth chart above, here is a graph of the actual levels of per capita real GDP indexed for Japan and the US. Japan's surging growth in the late 1980s that accompanied its stock market and real estate bubbles did put it above the US trend, but the levels converge again before year 2000. UPDATE 5/23/2011: After reading a post by Bill Mitchell today that appeared to contradict the findings in this post, I initially wondered whether I had erred by using the FRED2 data for Japan in which the real per capita GDP data is converted to 2009 US dollars at purchasing power parity. (i.e., perhaps this incorporated exchange rate effects as well.) However, today I extracted the appropriate source data from Japan's cabinet office and generated my own graph using yen-denominated values, and the trend line is identical to the FRED2 data I used. In other words, the trend lines for per capita GDP growth for the US as measured in dollars and Japan as measured in yen still are remarkably consistent with each other, just as this post initially showed. The main divergences in the two trends are in the time periods of roughly 1987-1990 and 1997-2000. 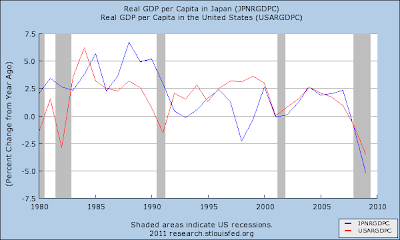 It turns out (based on my own graphs from the source data) that Bill seems to have accidentally switched the labels on the two lines in his second graph, so his nominal and real GDP per capita lines for Japan are reversed. Very nice post, and thanks. Do you have any reasons as to why Japan has such low inflation? Great question! I don't know why Japan's inflation has trended so low, but I am curious too! (b) could there have been widespread changes in labor wage setting mechanisms such as COLA (Cost of Living Adjustments)? (Would have to research the history here, especially post-austerity). Wages adjustments are as I understand it a very important component in determining inflation level and direction. Perhaps one day I'll review this enough more to have something to say in a post. As for the negative portrayal of Japan... yes it is widespread. Other than the reasons mentioned in the post (GDP as real vs nominal, per capita) I think too many people equate asset market performance with economic prosperity, so that probably adds to the bias toward the negative with respect to Japan.